Latin American border crossings are sketchy as hell. I once got into a massive argument with a taxi driver crossing the border between Ecuador and Peru where I exhausted my then-limited supply of insults and swear words in Spanish, only to end up riding in the cab for another ten minutes after realizing that I had no other choice! On the Bolivian-Brazilian border they tried to shake me down for 100 US dollars, claiming I had to pay to leave. I solved that problem by simply walking out of the office. Not so on the Mexican-Guatemalan border between Cuauhtémoc and La Mesilla. Transportation costs were reasonable, entry and exit stamps free, and money changers only passive aggressive rather than full-on in-your-face aggressive. I even got a better rate for my pesos than I would have gotten at a bank. Big steep mountains and valleys begin right at the border. The mist moves in and the run-down Mexican concrete buildings become run-down Guatemalan concrete buildings, the difference in the large painted advertisements and products for sale in the little shops which line the street in La Mesilla on the Guatemalan side. Tigo rather than Telcel, and Pespi replaces Coke. 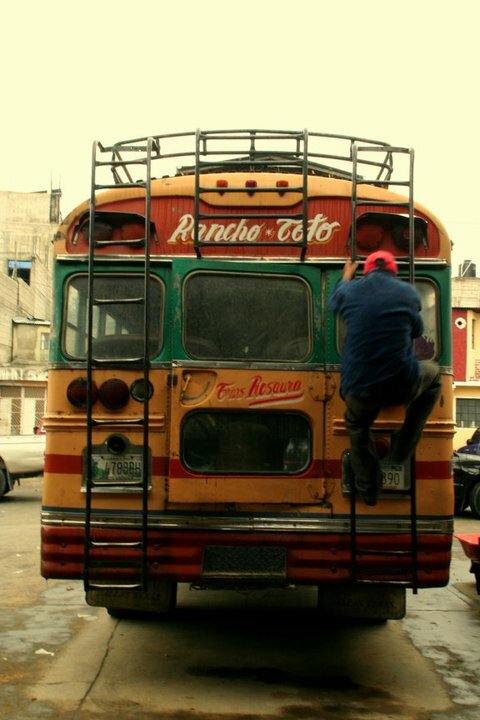 The fun really begins when I hop on a bus for the nearest big town, Huehuetenango. While walking up the street towards the always-just-around-the-corner bus station, the big old former American school bus pulls out, no longer dull orange but chrome-trimmed and brightly painted in all shades of pastel. 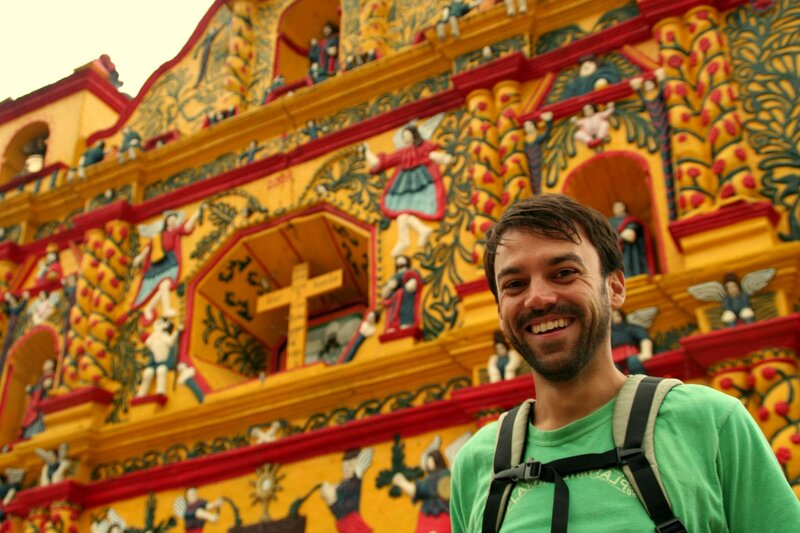 The guy hanging out the door spots my backpack and shouts ¨huehue!¨ – the abbreviation for Huehuetenango, my destination. I run up the street, jump onto the moving bus, and get a seat near the back – the preferred area when I was a student. It’s a blue bird bus and all, with the vinyl seats and the little spot near the front door where the first aid kit used to be, but full of people in their very colorful, traditional Mayan clothing and parcels of all shapes and sizes. They are called chicken buses by foreigners traveling in Central America, and yes, there are always several chickens on board for sure. 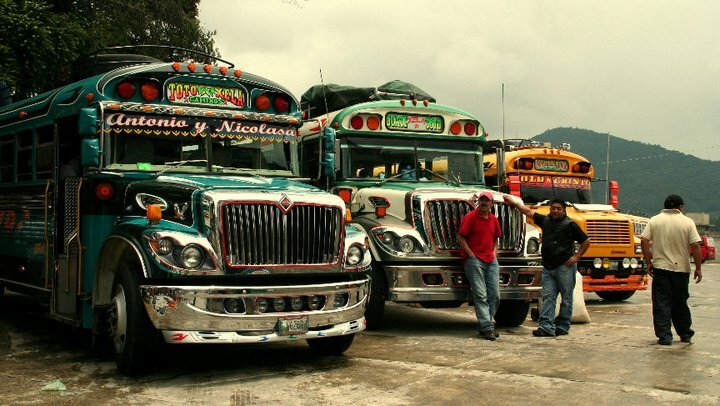 In Guatemala they are called ¨buses de parilla¨- which means a grill bus. Snake oil salesman board the bus and give long, grinning sales pitches for menthol creams and permanent markers, among other things. There’s lots of sing-song yelling by the bus staff about what the next stop will be. Somehow the main helper keeps track of who paid and didn´t – he doesn´t charge them when they board or disembark, but rather he comes around at odd times to collect unpaid fares. People sit 3 or 4 to a seat. In the most exciting moment, the bus helper climbs out the back door of the moving bus and onto the roof rack, only to reemerge through the front door after the next stop. The guy hits the topes (tumulo in Guatemalan Spanish, speedbump in English) super hard. We all bounce up in our seats, look at each other, and laugh. There’s a bit of a conflict between our bus and another at one point. The drivers pull up alongside each other and yell, and the bus helper runs out to try to board the other bus, but they pull the door tightly closed. The scenery gets more dramatic with steeper mountains of white cliffs on each side of the narrow valley. Cloud forest jungle creeps through rich, inclined farmland. We pass concrete-block small towns, and people get off in the middle of nowhere – only a small eroded trail that could lead them home. I transfer in Huehuetenango for a bus to Queztaltenango. After several more hours I am woken up by the driver, the bus empty and my head leaning on the window with my guitar beside me, unstolen. I get off the bus totally disoriented and wander through Minerva, Xela´s massive market, marveling at the size of the papayas and asking for directions all the way. As I wait on the side of the road for a local ¨bus¨(really severely damaged vans stuffed full of people), the mango seller crosses the road to give me more complete directions – that I should walk around the corner to catch the bus. Nice people! There are no fees to cross the border into Guatemala, though you might get asked. Is a dollar or two worth making a fuss over? Maybe. To enter Mexico you will have to pay, but I don’t know how much because I’m a Mexican resident now so it’s free for me. Even though the border is wide open, you have to go to the immigration offices on both sides to get stamps. They will check you down the road in Chiapas. From Comitan, Chiapas to Cuauhtemoc is a 35 peso van ride and then a 8-10 peso cab ride from the immigration office (where the van lets you off) to the border. Guatemalan immigration is right on the other side. The bus yard in La Mesilla is about a 10 minute walk uphill on the only main road. Take a bus to Huehuetenango and then transfer there for many destinations in Guatemala. It costs 20 quetzales. You can change money at the border. Look up the rate beforehand. I got a better rate than at a bank to change pesos to quetzales, and a little less than that for vice versa. I asked how much for dollars out of curiosity and got a terrible quote. There are lots of guys around, so if you don’t like the rate just hold out. It appears safe but for sure don’t go at night, and don’t have any exposed valuables. Somebody stole a small, empty backpack I had tied to my big backpack. Posted on June 28, 2011, in Guatemala, Mexico, Travel and tagged border crossings, chicken bus, Cuauhtémoc, guatemala, la mesilla, quetzaltenango. Bookmark the permalink. 6 Comments.